“The Mosquito’s Friend” – an article I wrote for Faces of Thailand in Chiang Mai City News, published in October 2014. “The Psychology of the Rematch” – a guest post for My Muay Thai (September 2012). “Blood, Sweat and Fears” – an article I wrote on early Muay Thai experiences in Thailand, published in Escape From America Magazine in February 2009. “A Sense of Where you Are….a Conversation with Muay Thai Champion Melissa Ray….” – an interview by Kevin S. Cummings for Thailand Footprint (June 2013). 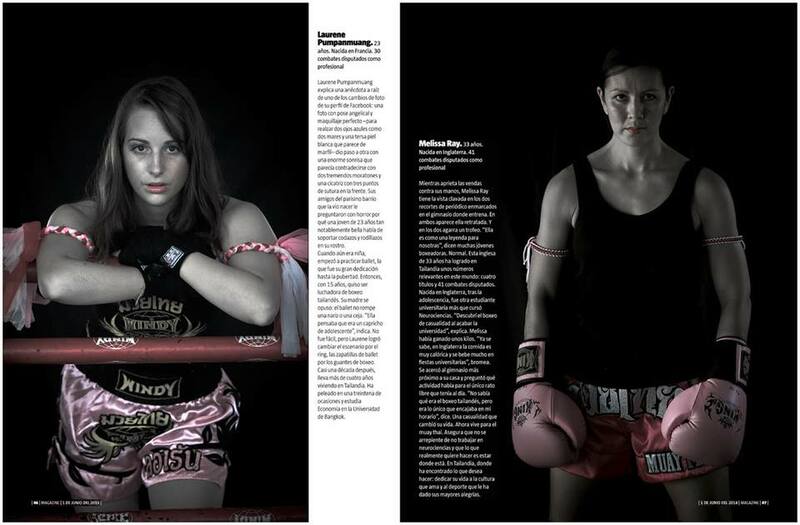 “The big-hitting expat women who became Thai boxing champs” – an article by James Goyder for The Telegraph (July 2013). “6 Boxing & Muay Thai Questions with Melissa Ray” – an interview by Michael Smith for his boxing blog “the road to pugilism” (October 2012). “50 Questions” interview in Muay Siam Weekly, Decmber 2010. “I Love Muay Thai” article in Muay Siam, March 2011. “I Love Muay Thai” article in Muay Siam, June 2013. “Women in the Ring” – an 8-page article by Luis Garrido-Julve (text) and Joan Manuel Baliellas (photos) on female Muay Thai fighters in Thailand (June 2014). The article was published in the Sunday supplement of Spanish newspaper La Vanguardia, and reviewed by Emma Thomas in Under the Ropes.